Residents of Teppi, a town sitting 360 miles south west of Ethiopia’s capital, called for the federal government help bring calm as tensions remain high after the killing of three people on Tuesday. Three residents of the town were killed after an attack by the indigenous people against other ethnic groups in the town. Two people were also injured in the attack. 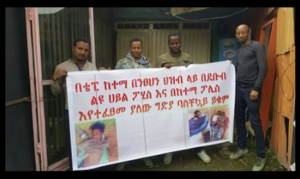 A resident who spoke to ESAT on the phone from Teppi said unease continues in the town as security force arrested unknown number of youth, who staged a peaceful demonstration to denounce the killings and urge the government to intervene. Some have also been beaten by the police, he said. The resident accused security forces of siding with the attackers and not doing enough to stop the killings. Roads leading to the town remain closed, according to the resident who also said there was shortage of food as businesses were not running in full swing. The attackers also looted shops and other businesses on Tuesday. Residents of Teppi say people in Sheka Zone who are considered outsiders by the locals were deprived of job and other opportunities.